Saltash.net community school was delighted to launch this year’s Children’s University Passport initiative for our new Year 7 students recently, with a fantastic number of parents and students attending to hear more about it. Children’s University is a national programme where children from the ages of 5-14 are encouraged to take part in extracurricular activities, collecting stamps in their ‘Passport to Learning’. Children are presented with certificates in school for reaching certain targets, and are invited to a ‘graduation ceremony’ held annually to celebrate their achievements if they reach gold level. 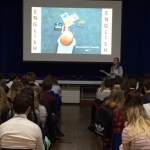 Saltash.net community school was all a-buzz recently as students enjoyed the school’s first ever post-16 Aspirations Day. 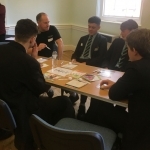 The day was designed to provide Year 11 students with the support and guidance needed to make decisions about their post-16 careers. Students were off timetable, taking part in a variety of different sessions aiming to provide them with information on all the opportunities they will receive, as well to outline the importance of working hard in preparation for their GCSEs. Four saltash.net students have been named amongst the most employable 17 year olds in the area, impressing business leaders from across the region in this year’s ‘You’re Hired!’ competition. The four students – George Lambert-Gorwyn, Kate Randall, Chelsea Adams and Callum Hillson – reached the final of ‘You’re Hired!’ 2018, and competed against finalists from other schools in and around the Plymouth area. They won through to the final by out-performing eighty other students in a series of business tasks during the school’s own ‘You’re Hired’ day earlier in the year. The students joined teams of other finalists to complete a challenging task over two days. They were tasked with designing a new theme park for Plymouth from scratch, including the rides, transport infrastructure, staff and budgeting. They then had to present to a panel of business leaders from the area, and answer a series of challenging questions. The judges commented on the very high standard of all of the teams’ work and praised saltash.net for consistently turning out ‘friendly, keen, enthusiastic and employable students’. Over 280 Year 10 and 12 students from saltash.net were out on work experience this month, with a variety of employers. Students enjoyed placements far and wide, with the furthest west being the Isles of Scilly, whilst the furthest north was Cardiff, with the Welsh Football Association. One student had the unusual placement of working for a horse dentist in the local area! The main objective is to give each student a good experience of an adult work environment, enabling them to improve their employability skills and to put the knowledge and skills they have learnt in their Personal Development lessons in to practice in a real workplace situation. The process starts many months in advance but always comes together with the help and coordination of our amazing Work Related Learning Administrator, Mrs Tracy Boulton. Saltash.net was privileged to recently welcome First Officer Michaela Brown into school for the day. Invited on board were students across years 8, 10 and 11, who listened to interesting and exciting tales of how it feels to be in the driving seat of a 66 tonne machine tearing through the sky at 980 km/h! Aspirations soared sky-high on the day, as students were encouraged to pursue their wildest dreams and explored the initial steps they need to take in order to achieve them. Budding pilots and eager Sixth Formers also took up the opportunity to speak to our high-flying guest and were left inspired and ready to work hard. Michaela was delighted with the students’ interest in her work. “It was a fantastic experience meeting the children from saltash.net and hearing what amazing ambitions they have for their future! I would encourage all of the children to follow their dreams and not be put off by how unrealistic it may seem at first,” she said. We are very grateful for the time that Pilot Brown gave to visit saltash.net; she certainly left her mark on our students, it was a truly memorable day!